Enlighten your marine aquarium LT-120. Keep your corals happy with brilliant LED lights. Great For Rimless Tanks. Illuminate your tank with all LED light that clamps on. Aquarium lighting is a very important aspect of keeping a healthy tank as well as for the growth of your fish and corals to live. Freshwater and Marine Aquarium lighting plays a huge role on physiological factors such as reproduction and breeding of fish. The type of plants and corals you have will determine how much many WPG (Watts per gallon) you need. A general rule is to keep your tank lit for at least several hours each day though to provide ample illumination in your fishtank. There are many types of bulbs - everything from metal halide to power compact bulbs. Each has its own distinct advantages over the other one as well as T5 H0 high output lamps which come in many Kelvin color varieties 65K, 10K, and 14 K.
Metal Halide bulbs come in 2 styles single ended mogul base and double ended. Both produce a significant amount of heat but are great for lighting saltwater aquarium corals. HQI aquarium lights typically come in a variety of styles. The Viper clamp on one is an example of this. Our HQI bulbs produce some stunning colors. One of the benefits of these types of bulbs is they are much smaller than traditional mogul based metal halide bulbs. They call these double ended as they have connections at both ends of the unit. There are many watts to choose from and Kelvin (color or temperature) spectrum to give your fish or corals the right colors they need for good growth. 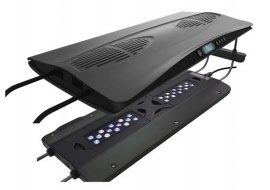 Please email us if you have any questions on aquarium lighting and to help you choose whats best for your fish tank. 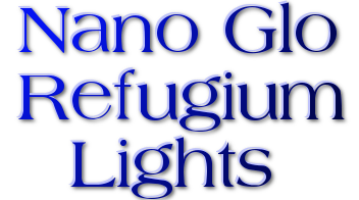 Looking for the perfect Macro Light for your refugium . We have the solution with the macro Glo.